MSC Meraviglia, the first ground-breaking mega-ship ship in the Meraviglia Generation to be introduced into the MSC Cruises fleet,has been designed to meet every need of today’s cruise guest – with cutting edge technology, flexible dining options, exclusive, world-class entertainment, facilities for families and children of all ages, luxurious pampering and wellness and comfortable accommodations. 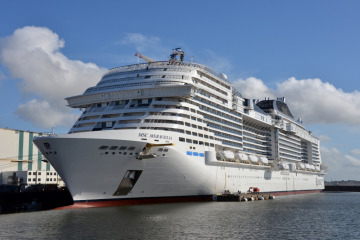 MSC Meraviglia is truly a next-generation cruise ship that has never been seen before. At 1,034 ft. long and 214 ft. tall, with an impressive 19 decks and capacity of 5,700 guests (4,488 at double occupancy), MSC Meraviglia is not only poised to become one of the biggest cruise ships at sea, but also one of the hottest holiday destinations, packed with innovative features to provide an unforgettable experience.